App is being written in Delphi 10 Seattle. Anyway, everything seems to be working great. I have no LiveBinding controls connected to the queries. Everything is being accessed through code, and rather minimally as well. Every now and then, when going to the home screen and then switching back to the app, I get the error message listed below, that I have an unauthorized access to "libsqlite.so". But then the database stuff still works great right afterwards. Is there something I should be doing on deactivate to get rid of this message? Thanks. 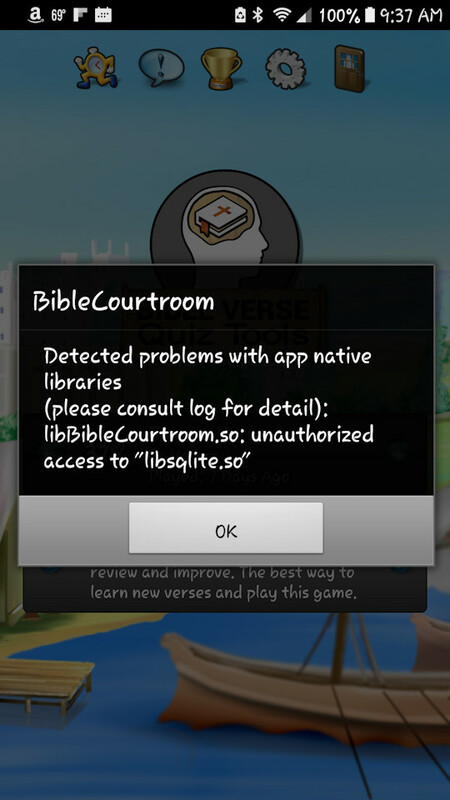 Detected problems with the app native libraries (please consult log for detail): libBibleCourtroom.so: unauthorized access to "libsqlite.so"
No answer yet, and I was digging around looking for ways to handle the OnFormSaveState event, so here is what I am trying so far. It is an intermittent error message, so it will take a couple days of testing to determine if I have this fixed. I am trying to close the database connection in OnFormSaveState and then opening it again when my form is reactivated in Android, which requires adding an App event handler and registering it. If anyone else wants to try this, here is the code required to do it. 1) You need to add FMX.Platform to your uses clause. 5) Make sure your OpenDatabase routine is smart enough to check if it is already open or add a force open flag. Because it will be called once on program restore, but twice during a normal program startup. 6) Here is my HandleAppEvent. I have some extra comments that records the order of events I encountered while testing different restore scenarios. Enjoy. Note I am not doing anything on WillTerminate since I already handle those things in OnFormClose. Then I switch out and come back into the app and get the error about unauthorized access. Any help appreciated. Not sure what I could be doing wrong at this point. Trying to figure out how to view the log that is mentioned in the error. My research so far points to a bug in Android 7 Nougat, and that is the only device that has shown the message in my testing. "In Android 7.0, the low-level Sqlite binary can no longer be used by apps. If you use one of the portable Sqlite libraries for .NET (like sqlite-net or Iridium), you will get the warning. Most libraries will be updated to use the "Android-approved" way of accessing Sqlite on the device." Further down in the same post, someone gives instructions on upgrading package libraries, but I am not sure how that will help my deployment issues. The bug sounds like it is understood and a fix is in the rollout phase. According to the description this problem occurs only when using Android 7 Nougat and is not directly related to LiteDAC behavior. You can test the work of the developing application using the Direct Mode : https://www.devart.com/litedac/docs/?work_net.htm when working with SQLite DB does not require any external libraries. Direct mode is buggy. I soon as I switched my android app to direct mode I started experiencing random data loss in tables. I would pull back my db from the Android device and tables would no longer have any data in them. I have 6 devices deployed testing an new version of my app and at least 1 a day comes back with missing table data. This never happen using the libsqlite library. Be warned. Did anything came out on that investigation ? Because it's quite annoying that error.